Are you ready to bust out of that sewer, and take the fight to the streets to battle the likes of Rocksteady, Bebop, Shredder and Krang? If it's time for you to take the mantle as one of the Teenage Mutant Ninja Turtle brothers, it's just not going to be enough to to use a TMNT costume to transform into Leo, Mikey, Raph or Donatello. You're also going to need the right accessories to make sure that you come out on top. 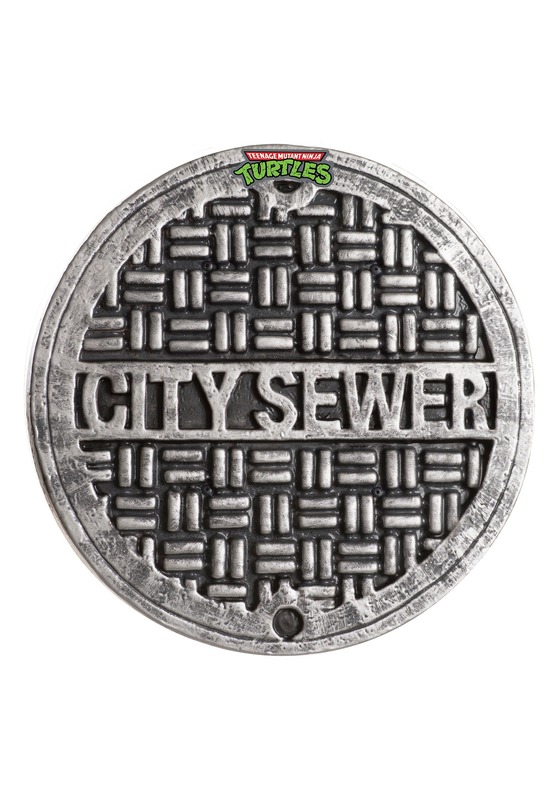 And this TMNT Sewer shield is going to give you the edge you'll need to make sure that the good guys score a bodacious win! This detailed accessory is TMNT officially licensed, and features a color franchise logo sticker on the brim. It has an embossed plastic design, complete with an etched "City Sewer" stamp so that it will look like you grabbed it from the streets of NYC while you were on your way to battle in the Technodrome. This costume accessory is sized for adults (but we carry a kids version too). It's sure to be the perfect way to complete your costume whether your look is going to be inspired by 2016's Out of the Shadows... or even if you're still rocking that old school movie or animated cartoon costume. However you want to suit up as a ninja turtle, this prop will complete your costume look. Cowabunga.